Notes: Mill Hill station opened to goods and passenger traffic with the Edgware branch on 22 August 1867. There was no goods yard as such although there was a weighbridge at street level between the station building and the stationmaster’s house. 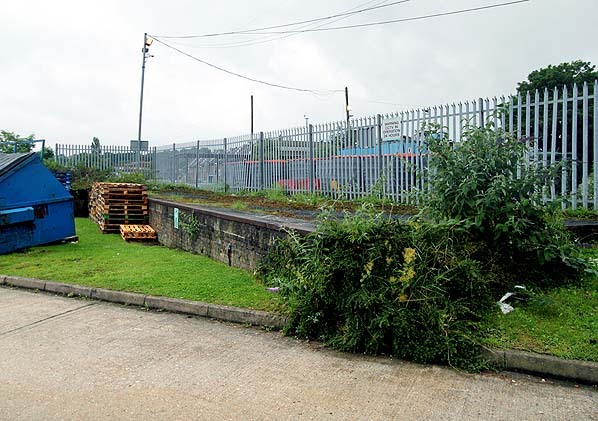 On the embankment there was a loop siding with a goods shed to the west of the platform. A private siding was laid into the North Middlesex Gas Company’s works to the west of the station in 1869. In 1904 the Railway Clearing House handbook lists a limited goods service comprising general goods and parcels only. we headed towards war with Germany. It served the nearby Inglis Barracks, home to the Middlesex Regiment and the Royal Engineers Eastern Command workshop which was literally at the end of the yard. As part of the 1935 'New Works Plan' the line through Mill Hill would be doubled, with a second platform provided. The plan was adopted, and work on the electrification and new infrastructure started alongside the steam service which continued to operate on the Edgware line. 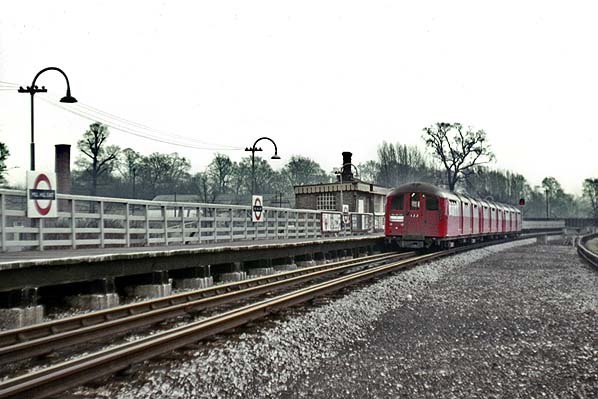 The service on the branch was suspended completely from 11 September 1939 to allow the work to be completed. The Mill Hill East booking office remained open for the sale of tickets which could be used on replacement buses. 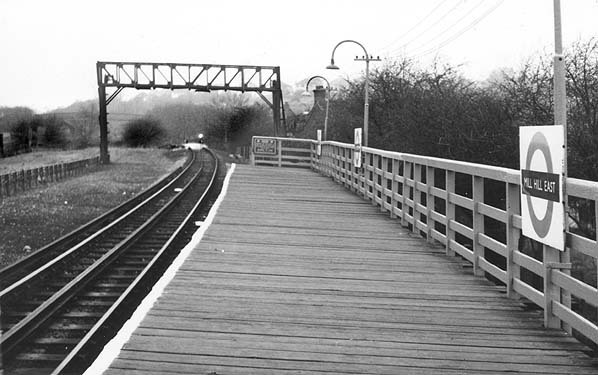 By the outbreak of war in 1939, a second track, complete with conductor rail had been laid as far as The Hale, but no work on a second platform at Mill Hill East had started. 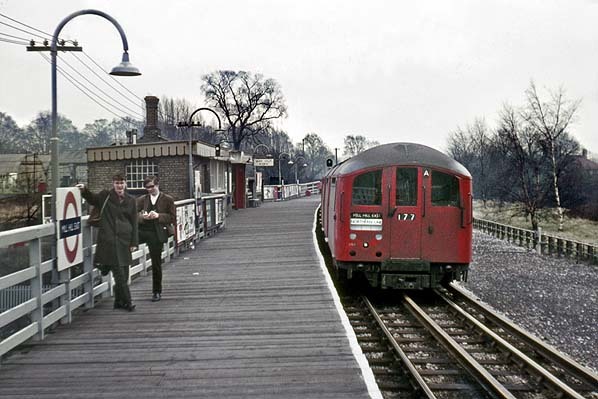 Although all work on the New Works plan ceased the electrification of a single line into Mill Hill East was completed to serve Inglis Barracks, and the station reopened with tube trains on 18 May 1941. 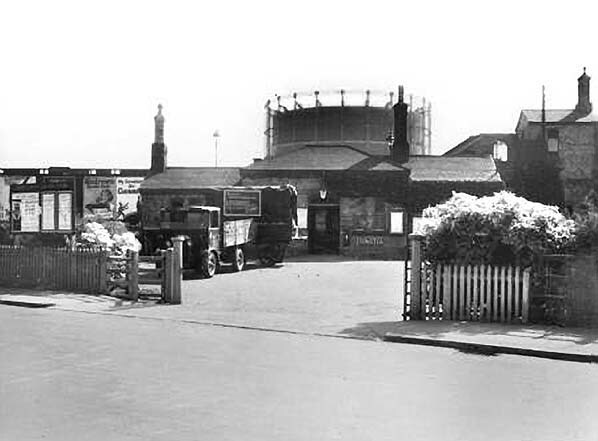 The original station forecourt was opened out to include a new bus turning circle. 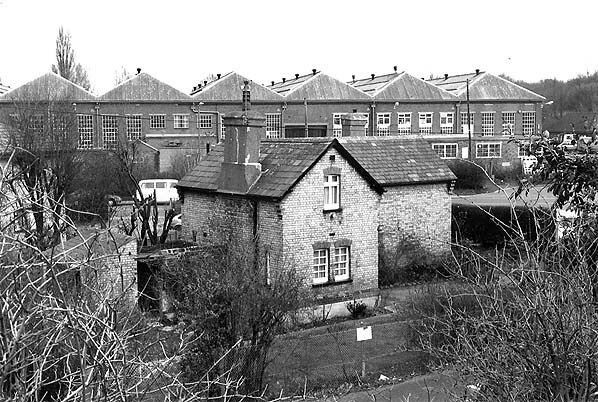 The goods service remained steam-hauled until closure of the Mill Hill East yard and the gas works siding on 1 October 1962.
either side have hipped roofs. The platform on the embankment above is reached by an attractive brick-lined staircase. At platform level there is a small brick waiting room with a short canopy at the top of the steps. 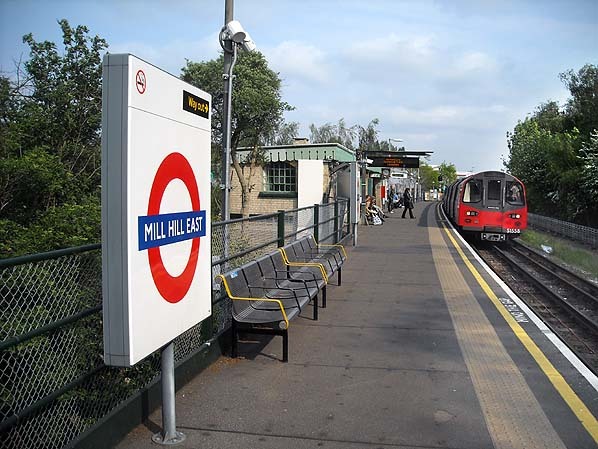 Mill Hill East is now the only station on the underground network with a timber platform although it was covered with asphalt in the early 1990s. It is also only one of three stations (the other are Chesham and Heathrow T4) on the tube network to have only one platform. The station stands at the back of a forecourt which still includes a bus turning circle. The two-storey brick stationmaster’s house, also built to a standard GNR design, stands to one side of the forecourt. withdrawn on 20 May 2007. There is a local desire to retain the direct peak-hour trains, particularly in the mornings, since these provide seats for passengers into central London, instead of having to change onto crowded trains from High Barnet at Finchley Central. The Edgware, Highgate & London Railway obtained an Act in 1862 to build an 8¾-mile line from a junction with the GNR at Seven Sisters Road (renamed Finsbury Park on 5 November 1869) to a terminus at Edgware. The GNR agreed to work the line, providing staff and rolling stock in return for 50% of the gross receipts. The following year, the Midland Railway received authority to build a line between Bedford and St Pancras which would provide a quicker route into central London from the Mill Hill area. To improve the prospects of their Edgware line, the EH & LR proposed a branch from Highgate to Muswell Hill serving the new Alexandra Palace leisure complex and an 6¾- mile extension of their main line from Edgware to Watford. Both proposals were approved by Parliament in 1864, as was a further branch from Finchley to High Barnet in 1866. The main line between Seven Sisters Road and Edgware proved more costly than expected with tunnelling required at Highgate and a high viaduct taking it over the Dollis Brook. The local company was soon in financial difficulty and, shortly before completion, the EH & LR was taken over by the Great Northern who opened the line on 22 August 1867 with intermediate stations at Crouch End, Highgate, East Finchley, Finchley & Hendon (renamed Finchley on 1 February 1872, Finchley [Church End] on 1 February 1894 and, finally, Finchley Central on 1 April 1940) and Mill Hill (renamed Mill Hill East for Mill Hill Barracks from 1 March 1928). The new line was double-track between Seven Sisters Road and Highgate and single-track beyond Highgate, with passing loops at Finchley & Hendon. It was assumed that the north end of the line would be doubled at a later date so some structures, including the viaduct over the Dollis Brook, were built to a width that would accommodate a second track. There were 18 daily workings in each direction, although eight of these ran only between Seven Sisters Road and Highgate. The line was doubled between Highgate and East Finchley on 1 December 1867 and to Finchley & Hendon on 1 November 1869, prior to the opening of the High Barnet branch on 1 April 1872. To accommodate the extra traffic expected to be generated by this branch, Finchley & Hendon was rebuilt with an additional platform face which allowed services that had previously terminated at Highgate to be extended. With the opening of High Barnet the service was improved, with 24 trains in each direction to central London. The majority of these trains ran from High Barnet with only one through service in each direction between central London and Edgware, and a shuttle operating between Edgware and Finchley, where passengers for London had to change. The junction with the Edgware line made through running difficult as there was no direct connection between the down line and the original single track. It was reconfigured in June 1896 which allowed more through services to run to Edgware, but there were never more than six in each direction. In an attempt to reduce running costs two GNR steam rail-motors, built to a design of H.A.Ivatt, were brought in to operate the shuttle service between Edgware and Finchley on 19 February 1906. The rail-motors brought little improvement to passenger revenue with only an additional £9 in passenger receipts in March 1906 and earnings per car of 5d per mile, while running costs were 7d. In an attempt to generate additional income, a halt was opened at The Hale on 11 June 1906. It was conveniently sited close the Midland Railway's Mill Hill (today known as Mill Hill Broadway) station, enabling easy interchange. The rail-motors proved unpopular with passengers as they gave a rough ride with continuous vibration. Within a few months they were withdrawn and replaced with conventional steam traction. Rail-motors were once again tried in September 1929. This time a 59-seat Sentinel, The Rising Sun, was used, but it proved as unpopular as its predecessors and was withdrawn the following year. In 1935 the London Passenger Transport Board announced their 'New Works Plan' which included a proposal to take over the ex-GNR line between Finsbury Park and Edgware / High Barnet and the Alexandra Palace branch. The plan included the doubling and electrification of the Edgware line with improvements to the stations including a second platform at Mill Hill East and The Hale. The GNR station at Edgware would close to passengers with trains being diverted into the Underground station which had opened on 18 August 1924 as the terminus of the second phase of the Underground Group's extension of the Charing Cross, Euston & Hampstead Railway from Golders Green. The ‘underground’ station – actually on the surface - would be enlarged and rebuilt as a through station with the line extended northwards to Bushey Heath, utilising part of the route of the EH & LR extension to Watford which had not been built. All of these lines would be incorporated into the Northern Line, and a new connection with the Northern City line at Finsbury Park would provide a fast and frequent service of electric trains into central London. The New Works Plan was adopted, and work on the electrification and new infrastructure started alongside the steam service which continued to operate. On the Edgware line this was still largely a shuttle service with running intervals of between 30 and 50 minutes. There was now only one through service departing from Edgware at 7.52 am. Work on the electrification and track doubling started in 1938. The service on the Edgware line was suspended on some Sundays, and on 3 July 1939 the existing Northern Line service was extended from Archway to East Finchley where it surfaced alongside the LNER line from Finsbury Park, just south of the station. The service on the Edgware line was suspended completely from 11 September 1939 to allow the work to be completed. The stations remained open for the sale of tickets which could be used on replacement buses. The New Works Plan was expected to be completed with all lines open by spring 1941. All the new lines were shown as 'under construction' on LPTB pocket maps from 1938 onwards. By the outbreak of war in 1939 work to integrate the Edgware line into the Northern Line was progressing well. A second track, complete with conductor rail, had been laid as far as The Hale, and a second platform had been built there. Lineside cabling had also been installed, and sub-stations built at Edgware and at Page Street (between Mill Hill and the Hale). At Edgware a plate girder bridge was built to carry northbound traffic over the Northern line and on towards Bushey Heath. The Northern Line station at Edgware had been remodelled to accommodate the additional service with new platforms partly built and a new signal box completed. 1940 with the start of the Blitz, with the exception of the line between Finchley and Mill Hill East because of the strategic importance of nearby Inglis Barracks - home to the Middlesex Regiment. Mill Hill East re-opened with tube trains on 18 May 1941. At the same time the replacement buses were withdrawn and were replaced by extending the existing 240 route from Mill Hill Broadway to Mill Hill East. After 1941 the various unfinished Northern Line extensions were removed from subsequent Underground maps, although they reappeared between 1946 and 1949. 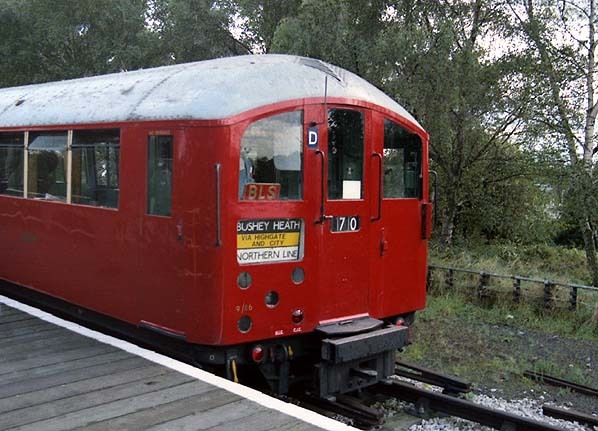 London Transport had every intention of completing their New Works after the war, hoping to finish the line between Mill Hill East and Edgware in 1948 with the extension to Bushey Heath being opened the following year. Despite these optimistic expectations no further work was undertaken, and in 1950 London Transport announced that that the route between Brockley Hill (north of Edgware) and Bushey Heath would not be built as it contravened Green Belt regulations. 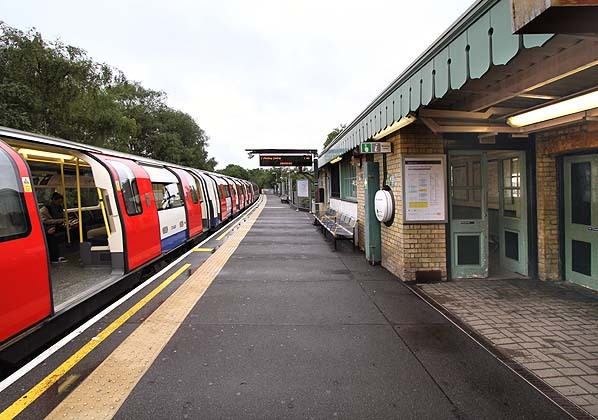 Without the line to Bushey Heath, it was felt that construction costs of completing the upgrade of the Finchley – Edgware line would not be recouped by expected traffic, so this too was dropped. All of the uncompleted Northern Line extensions were officially abandoned in February 1954. This was quickly followed by the closure of the Alexandra Palace branch on 5 July 1954. As the service on the Edgware branch had already been suspended from 11 September 1939 it was never reinstated, and the stations remained closed to passenger traffic. Despite closure of The Hale in 1939 the booking office at Mill Hill Broadway was still selling tickets from Mill Hill (The Hale) until the late 1960s. These were valid on the 240 bus and differed from ordinary Underground tickets by having the name underlined. Click here for a light hearted film about the unfinished Northern Line extension. Tickets from Brian Halford & Michael Stewart. Bradshaws from Chris Totty. B & W street maps from Alan Young. Route map drawn by Alan Young. 1898 1:2,500 OS map. Although rather faint, a loop siding and what appears to be a goods shed can be seen to the west of the station. A weighbridge (WM) is seen in the station forecourt below. 19611:2,500 OS map. There has been considerable residential, industrial and military development of the area since the 1898 map above. Note the new goods yard to the east of the station. The large building at the top of the map is the Royal Engineers Eastern Command workshop. 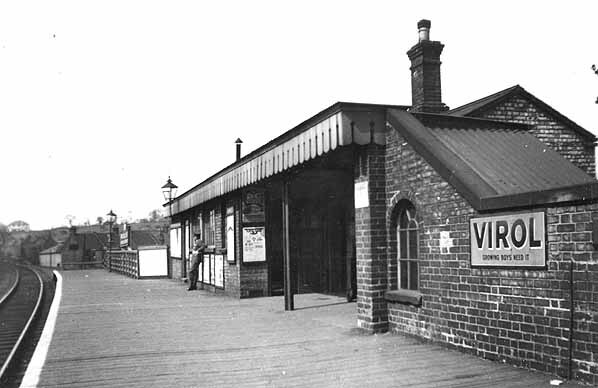 Mill Hill East station looking west c. 1930s. What appears to be the goods shed, described earlier, is seen beyond the platform. 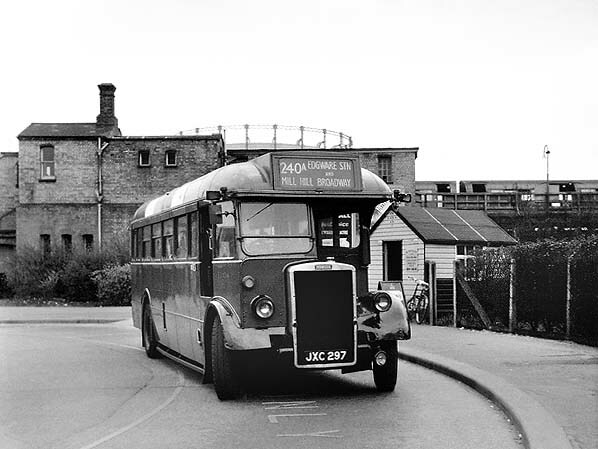 London Transport bus TD104 sits in the Mill Hill East station forecourt in 1962. Route 240 was introduced in the 1930s between Edgware and Golders Green and replaced the former London General Omnibus Company Route 104. Initially it was split into two sections, the Mill Hill Broadway station to Edgware section being operated by single-deck TDs and the Mill Hill to Golders Green section by double-deck RTs. This was because of the low railway bridge over Mill Hill Broadway which did not permit double-decker operation. The single-deck part was renumbered 240A and extended to Page Street, and then in 1951 was further extended to Mill Hill East station. Route 240A is notable at this time as being the only London bus route that has ever accepted single tube tickets, between Mill Hill East, Mill Hill Broadway and Edgware in lieu of the planned extension of the Northern Line. A ticket for Mill Hill (The Hale) cost a little more than one to Mill Hill East, and enabled the passenger to retain his tube ticket for use on the 240A anywhere in the direction of Edgware. In 1966, the two part-workings were re-combined into a single through route when the M1 Motorway was built and the bridge at Mill Hill Broadway replaced with a higher one which permitted the use of double-deckers. Mill Hill East station looking west c. 1960s. The goods shed has now gone. Mill Hill East station looking east in 1966. 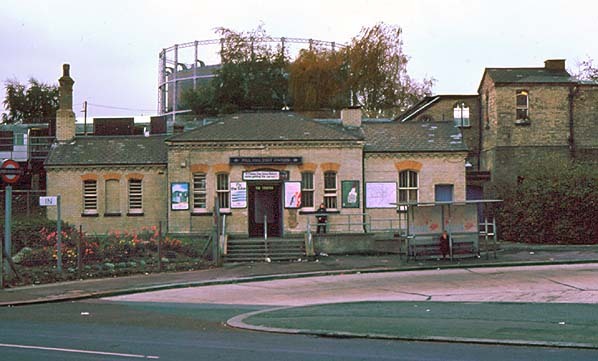 Mill Hill East station forecourt in October 1978.
was: Bushey Heath via Highgate. Mill Hill East stationmaster's house is a typical GNR building. It could still be clearly seen in February 1993 but is now surrounded by high bushes and trees. The building to the rear is the Royal Engineers Eastern Command workshop. Mill Hill East station looking east in April 2011. The timber platform survives but has now been covered with asphalt. Mill Hill East station looking west in July 2012. The Finchley shuttle stands at the platform. east side of Bittacy Hill.